It is spring, which means spring cleaning! Even though we still have snow on the ground, we are getting started (because I am hoping for warmer weather and because it needs it). 5 years ago this spring (April 2, 2014 to be exact) our house burned down while we were on our Spring Break vacation. Talk about the ultimate decluttering, we did it all in one day! If you would like to read more about the fire and the lessons we have learned from it, you can read this blog post —> When The Unthinkable Happens: Lessons From A House Fire. We lost so many irreplaceable things in the house fire: family scrapbooks, my wedding dress, pictures, family heirlooms, old movies, etc. Those things can’t be replaced. Oddly enough, those are the things that people have a hard time getting rid of when they start decluttering. But there are many, many things that can be replaced after a house fire and after 5 years we are back to a cluttered state. From the generosity of friends to a mad shopping spree after our new house was built, we are almost caught up to where we were pre fire. If you didn’t know our story, you wouldn’t be able to tell we had lost everything just 5 years ago. It’s amazing and sad at the same time. So here we are, looking at our home and thinking we need to make it more clean and organized. We need to get rid of the stuff we don’t need anymore and organize the rest. As I said above, we haven’t felt the need to declutter much in the past 5 years because of how much we lost in the fire. But before that, I would try to declutter our home once a year to keep the toys and clothing down (having 3 boys in 4 years can wreak havoc on a home) and anytime we moved (we moved 6 times in our first 12 years of marriage). When you have a growing family, you can get rid of things your kids don’t wear or use after the last child grows out of it. It can help your kids see what they have to play with when they have less to choose from. It gives you more room in your home when you don’t have random junk laying around. It allows you the chance to get rid of things you don’t need or want anymore. Decluttering can help you save money by finding things you didn’t realize you had, instead of buying it over again. It allows you to bless the lives of others with items you don’t need or use anymore. 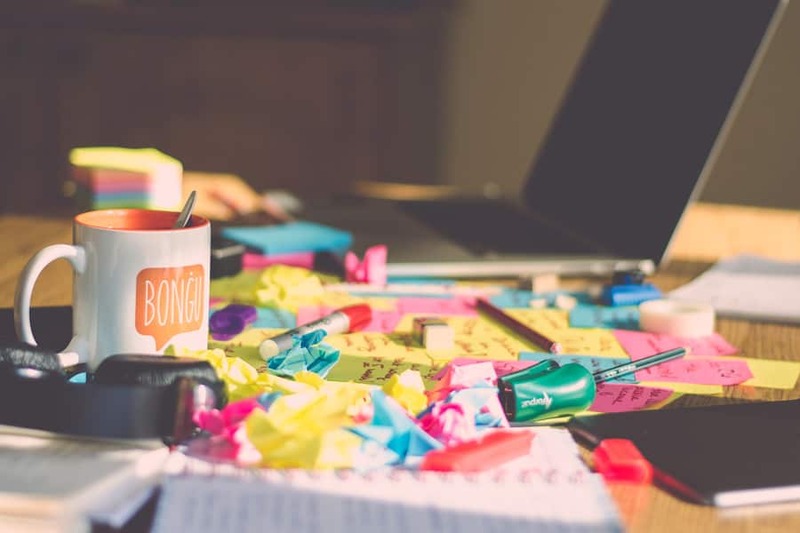 In the last couple of years or so, there has been a new decluttering craze in the world called the KonMari Method by Marie Kondo. I had heard of it, but since we didn’t have alot of stuff, I didn’t pay much attention. 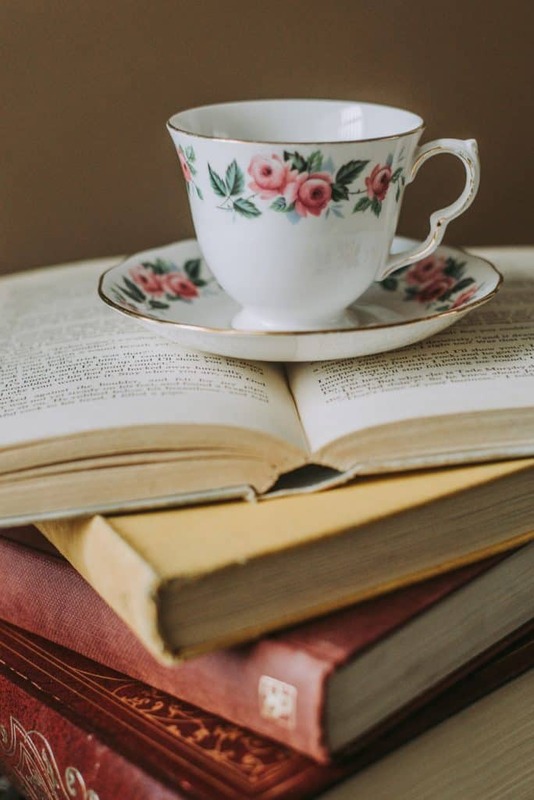 It all started with her book about Japanese decluttering and organizing called The Life-Changing Magic of Tidying Up: The Japanese Art of Decluttering and Organizing. Then this year (2019) Marie starred in her own Netflix show (Tidying Up With Marie Kondo) where she brings the method to America and helps Americans get their homes in order. I must admit that I was interested, since I love Netflix and I needed something new to watch this winter. I watched several episodes to get a feel for Marie and her method of decluttering. I AM NOT AN EXPERT on this method or Marie, but here are my findings and how the show has helped us organize our lives. Figure out what you want your space to be used for. Papers: I like that there should be one designated spot for papers in the home. For us, that’s my office. Not everything sparks joy, and that’s ok. I won’t be thanking my belongings. I won’t be putting all my clothes in a pile. I prefer to work by room than by category. I won’t be meditating (or introducing myself to the house) before cleaning. I won’t be throwing things outside on the lawn or driveway. I won’t be thinking that this is a one and done deal. It should be a yearly practice in our home. 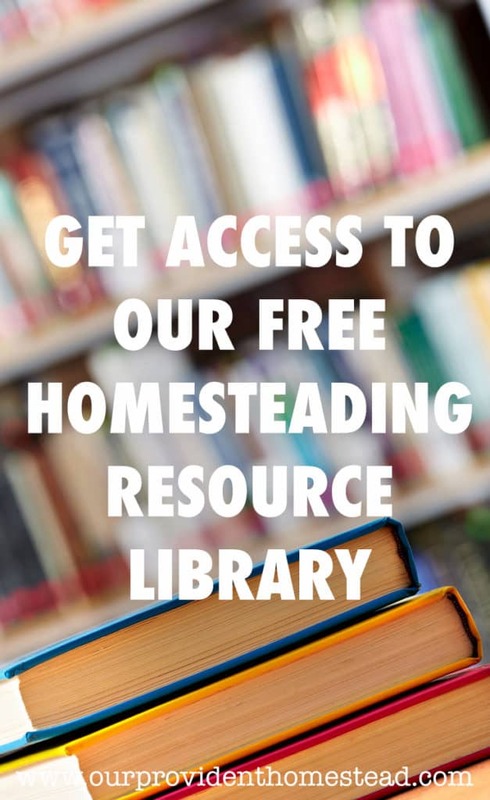 So how does homesteading fit into all of this organization? 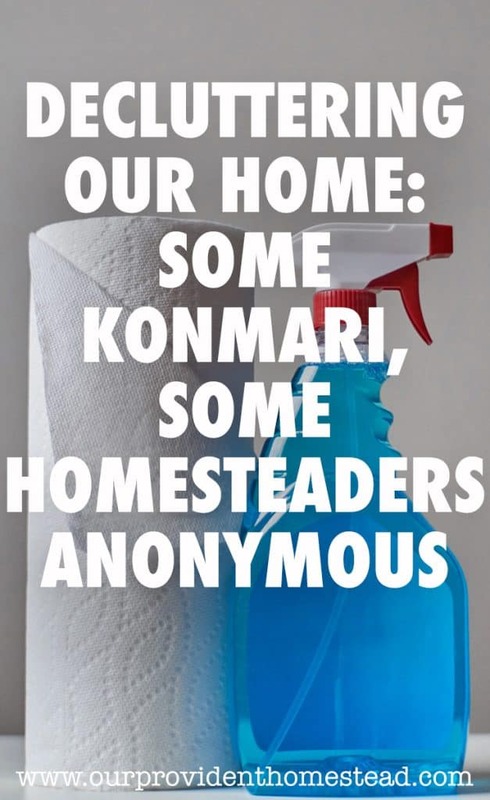 I know so many homesteaders that have a mess on their hands because they feel they should be reusing items instead of throwing them away. They don’t want to get rid of something, for worry they might find another use for it in a month, year or ten years from now. 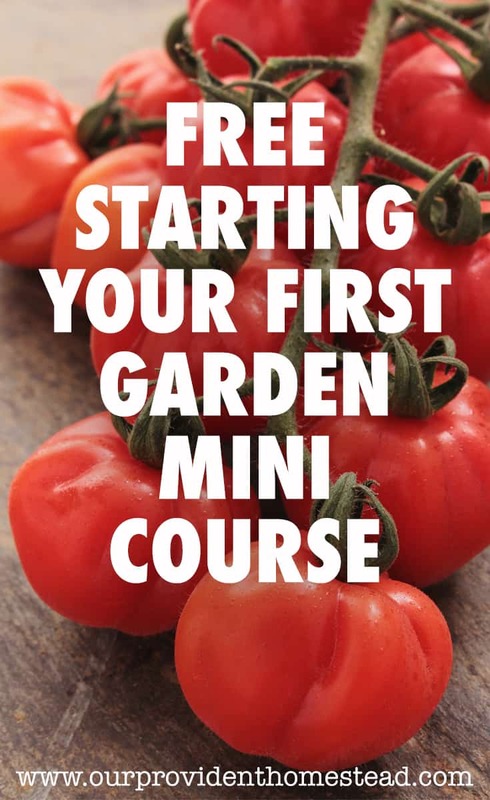 In fact, I just wrote a post the other day about 10 Household Items to Recycle in Your Vegetable Garden. 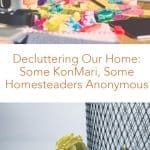 How do homesteading (recycling, making do, saving for later) mesh with decluttering (minimalism, organization, getting rid of stuff)? Well that’s up to you. It depends on how having all the stuff makes you feel. Does having extra stuff make you feel secure and prepared or frustrated and scared? Is that extra stuff organized so you can find and use it later? Is your home peaceful in its current state or does it need help? There isn’t a right or wrong. There can be a middle ground between minimalism and hoarding. In fact, most people fall somewhere in the middle. For instance, I have clothes of different sizes. I was smaller when our house burned down 5 years ago, so when I went to shopping to replace my clothes they are all a smaller size than I wear today. But I am on a (slow) weightloss journey, so I know I want to keep those clothes so I can wear them when I lose weight. After all, they are only 5 years old! So what is the middle ground? Maybe take them out of my closet and box them up until I can wear them. Or separate my closet by size and slowly get rid of things as they get too big for me. Either way works. I guess it just depends on how much space you have in your closet. 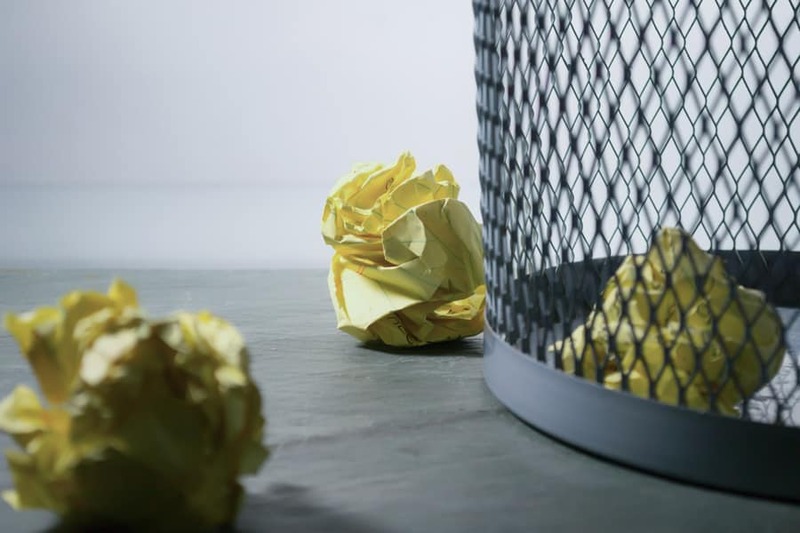 If you are feeling like maybe your stuff is getting out of hand or you want to downsize to save time and money, decluttering can be a lifesaver. Now I know this doesn’t seem like much, but considering we lost all of our possessions in a house fire 5 years ago, I’m amazed we have this much to give away. 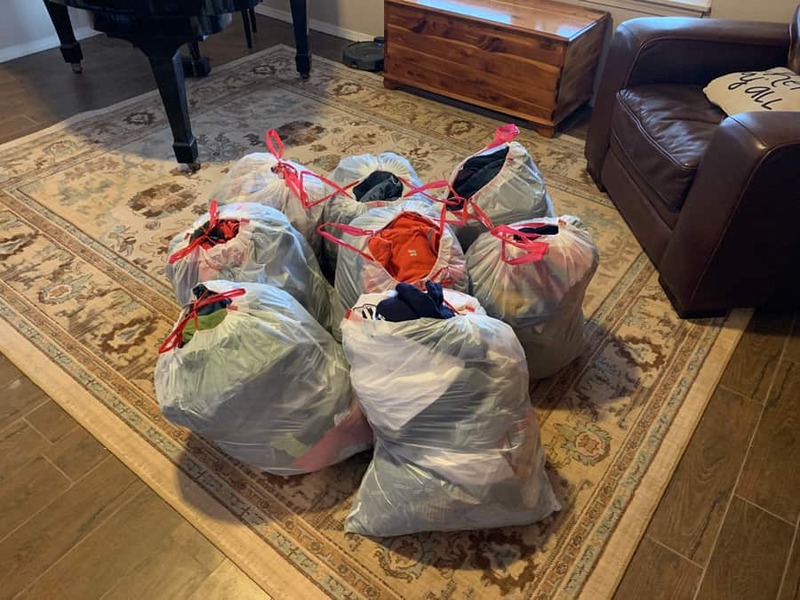 That’s 8 bags of clothes, ready to give away. It really piles up fast. I always feel better after I clean and declutter. The house is more relaxing and enjoyable when it is clean and organized. Now do I think it is going to stay this way with three teenage boys? Definitely not. But I’ll enjoy it while it lasts. What can you get rid of on your homestead to bring you more peace and comfort? Let us know in the comments below. And if you found this post helpful, please share. Thanks! 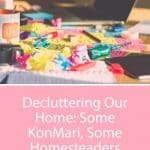 Oh, I can definitely relate to the homesteading hoarding and wanting to be somewhat minimalist! We have 6 kids, and we bought a homestead that was already a homestead that came with a bunch of stuff!!! We have been very slowly decluttering…hard to do when you are busy and your kids are home all of the time! It took us two and a half years to begin the decluttering process, just because we were trying to figure things out. We started to heavily declutter the house over a year ago, and we have been working on the outside stuff since fall. We had sooooo much stuff that we didn’t even know what we had. We started getting rid of things that were broken that we thought we’d have time to repair, things that we had excessive amounts of duplicates of (we had people giving us old garden tools, we had our own, and the house came with a bunch), and things we didn’t think we’ll be needing in the next few years. As much as I hate the idea of purchasing something we already once owned, we needed order around here more so that we can actually have a functional homestead. We are working on organizing what is left, and we are feeling so much better! Sounds like you are doing a great job! 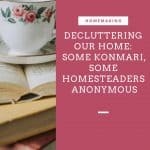 Decluttering can be overwhelming, but I feel like a more functional homestead is worth it. Good job!